Please fill in the form on the back of the notice co01pletely and return ii to our office either by placing it in an envelope and putting it in the mail or by dropping it off al our office. Voters must be affiliated with a political party (Democratic or Republican) in order to vote in the June 28, 2016 Primary Election. To mail a ballot to you we need to have the affiliation notice returned to us by June 20, 2016. Unaffiliated voters who affiliate and want to vote in the Primary can pick up their ballot (when they are available) with their completed notice at the Clerk and Recorder's Office up to 7:00 p.m. on Election Day. If you are unsure of what party you are affiliated with or what your current address information might be, please take the time now to check with our office or go to www.govotecolorado.com to check your registration information. You may also change your affiliation before the deadline of May 31, 2016 or change your address by obtaining appropriate forms from the Clerk and Recorder's Office or al the above listed web site. After May 31, 2016 deadline you will have to vote the parties' ballot that you are affiliated with on the registration records. June 28, 2016 Primary will be an all-mail ballot delivery election for Kiowa County Voters. If you have moved since the last election you might need to update your address with us. Doing so will insure that you get your ballot in the mail at your correct address. Ballots are not FORWARDABLE so we need to have your current address information in order for you to receive your ballot. 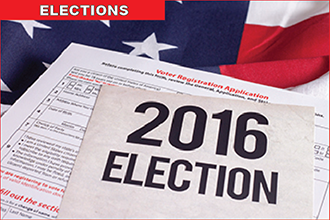 Ballots for all eligible registered voters will be mailed June 6 - June 10, 2016. There will be no Voter Service/Polling Centers open Primary Election Day other than the Courthouse. All voted ballots; replacement ballots or affiliation declarations must be returned to the Kiowa County Clerk and Recorder's Office, 130S Goff Street Eads, Colorado 81036.
a.m. to 12:00 p.m. for return of mail-in ballots; issue replacement ballots; register to vote; update addresses; update name; cast a ballot or vote a provisional ballot. General Election: Tuesday, November 8, 2016 ballots will be mailed to all active voters registered in Kiowa County. The Election Department can be reached at 7 19-438-5421 for voter and election questions or recording information or by email at delisa.weeks@state.co.us.